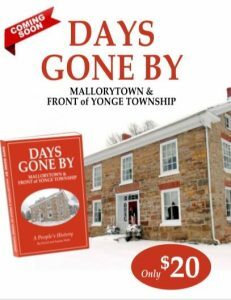 At the Brockville Museum on Monday, December 10th at 7:30 pm, the Branch welcomes Dave and Sandra Wells, introducing their new book Days Gone By, containing stories and pictures of Mallorytown and Front of Yonge Township. This third book on the history of the area is sure to be a welcome Christmas gift for anyone with ties to Front of Yonge. The Leeds & Grenville Branch of the Ontario Genealogical Society meets at the Brockville Museum, 5 Henry Street, and meetings are open to everyone. Come out and learn some fascinating history – you may even discover ancestors you didn’t know you had! This entry was posted in Meetings and tagged Family History, Front of Yonge Township, Genealogy, Mallorytown on December 5, 2018 by admin.